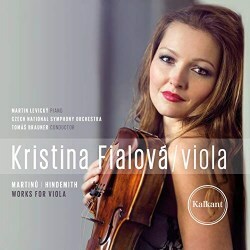 Hindemith and Martinů make for a well-matched pair in this viola disc, with a sonata and a larger-scale work apiece. The former’s Sonata, Op.11 No.4 was his first for his own instrument, at which he excelled as an international soloist and chamber player, and it has retained its place as one of his most outgoing and splendidly conceived sonatas. The excellent Czech player Kristina Fialová plays it with acumen and intelligence, not least in the second movement’s theme and variations, which is wittily and athletically pointed, and in the deft dynamics of the finale. Here her restrained refinement is matched by flowing elegance and pianist Martin Levický plays with comparable assurance. It’s only when one turns to the 78rpm recording that Primrose made with Sanromá that one finds colour and refulgence of tone and phrasing that the newcomer cannot really match. Martinů’s Viola Sonata dates from 1955 and the playing here conforms to the rather restrained impression left by the Hindemith. Bigger personalities than the Czech duo, such as Maxim Rysanov and Katya Apekisheva on BIS, play this with far more interventionist attack. Fialová’s vibrato has less colour and shading than Rysanov’s, and she makes fewer expressive gestures, preferring instead a rather straighter reading. If you find Rysanov a little overwrought in the opening of the Poco andante – I don’t - you may well prefer Fialová’s more measured approach. In general, though, the BIS duo shape the line with consistent interest, and the Czech team seems rather static in comparison. The Rhapsody Concerto is one of Martinů’s most popular works and receives a performance worthy of its open-hearted lyrical impulses. Again, Rysanov has recorded this and he is the more probing and expressive player. Fialová is more urgent in the second movement though a touch less subtle but plays the reminiscence theme – like the similar moment in Dvořák’s Cello Concerto - with calm eloquence and great poise. If one feels she could be more touching yet, perhaps the recording has something to do with it; it’s a touch blunt and not cushioned as is the BIS, where the BBC winds come through much more prominently than those of the Czech National Symphony. Trauermusik is played with Fialová’s characteristic restraint and slightly cool objectivity. Her compatriot Vladimír Bukač is a more wholehearted exponent on Calliope, partnered by Valék and the Prague Radio Symphony – they also play the Martinů (very well indeed) and the Bartók Concerto. I don’t normally comment on such things, but the booklet typeface is horrible though the text itself is fine. As noted, the recording tends to be a bit harsh. The performances are admirably direct though not invariably expressively satisfying.